The 2015 Great American Beer Festival begins in less than a month, so it's a good time to take a look at the Texas breweries that will be attending this year. 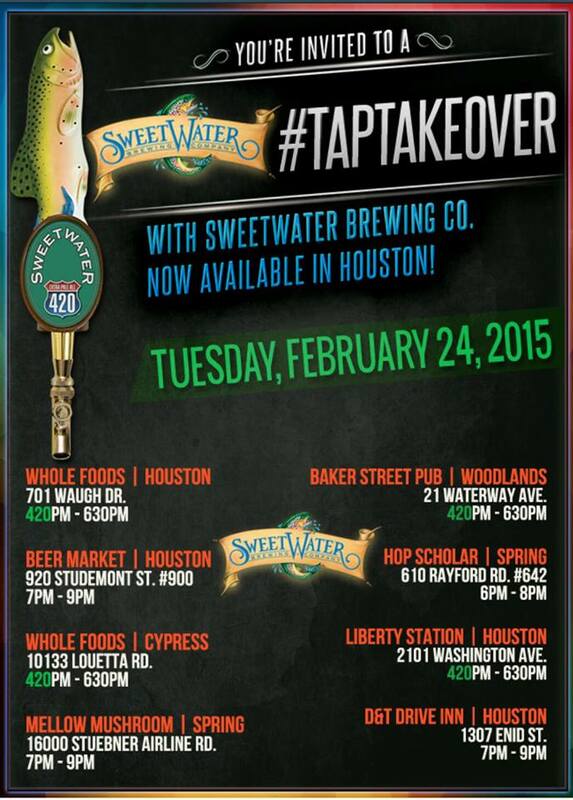 This is another great turnout from Texas and includes quite a few new breweries. Hopefully this will result in another great medal showing after Texas breweries took home 16 medals last year and 10 the previous year. Good luck to all the breweries who have beer entered in the competition this year and I look forward to sampling your beers on the convention floor. 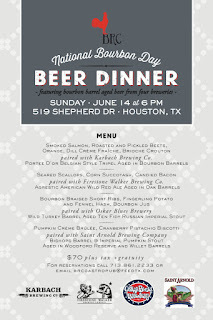 In celebration of National Bourbon Day this Sunday, June 14th, BRC Gastropub is hosting a special beer dinner featuring bourbon barrel aged beers from Karbach, Firestone Walker, Oskar Blues and Saint Arnold. 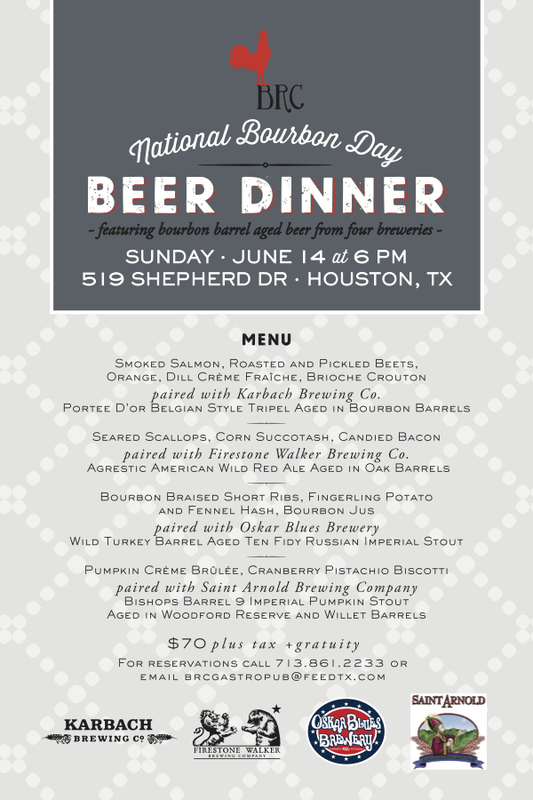 The cost is $70 per persons and reservations are required which can be made by calling 713-861-2233 or sending an email to brcgastropub.@feedtcc.com. 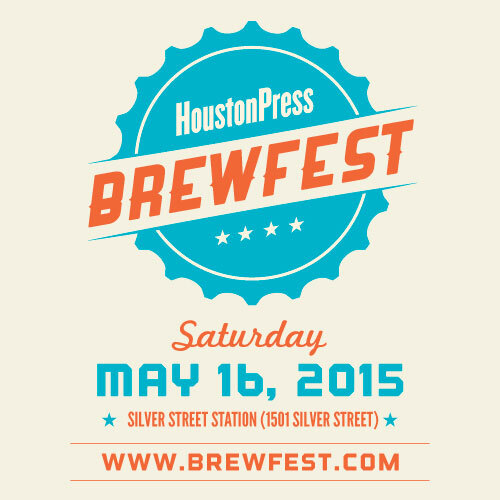 The 4th Annual Houston Press BrewFest takes place on Saturday, May 16th from 3pm ~ 7pm at Silver Street Station (the same location as previous ones). 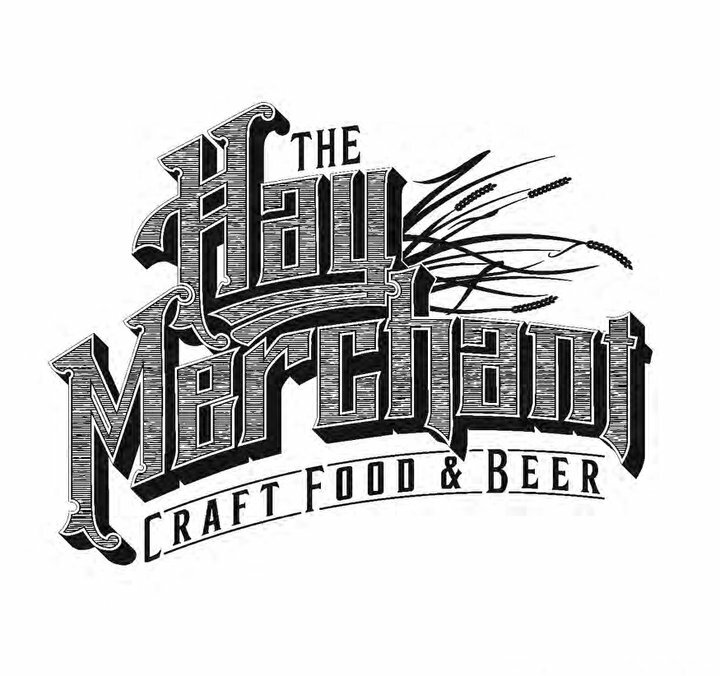 Over 100 beers will be available (beer list available soon) as well as food trucks and live music. 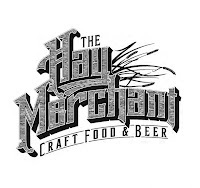 It's a great festival for trying a variety of beer styles in one place as well as an opportunity to try some of the new craft breweries that are not widely available. If you want to see what it's all about, check out the video from last year's BrewFest. General Admission and VIP ticket options are available and both include eight 3oz sample cards (additional cards will be available for purchase). VIP tickets include early admission at 2pm to begin your sampling one hour before the General Admission ticket holders as well as in-and-out access to a VIP area with additional specialty beers and complimentary appetizers. Tickets officially go on sale to the public at noon on March 21st with early bird pricing (GA $30, VIP $55) before increasing to regular prices (GA $35, VIP $60) on April 28th. If you're a procrastinator, there may be some remaining tickets at the door (no guarantee), but for a much higher prices (GA $45, VIP $70), so you may as well go ahead and grab a couple tickets now for cheap. And if you're really excited about it, you can get in on a special pre-sale starting today by going to this link and entering promo code ALLGOOD15 to unlock the purchasing options. 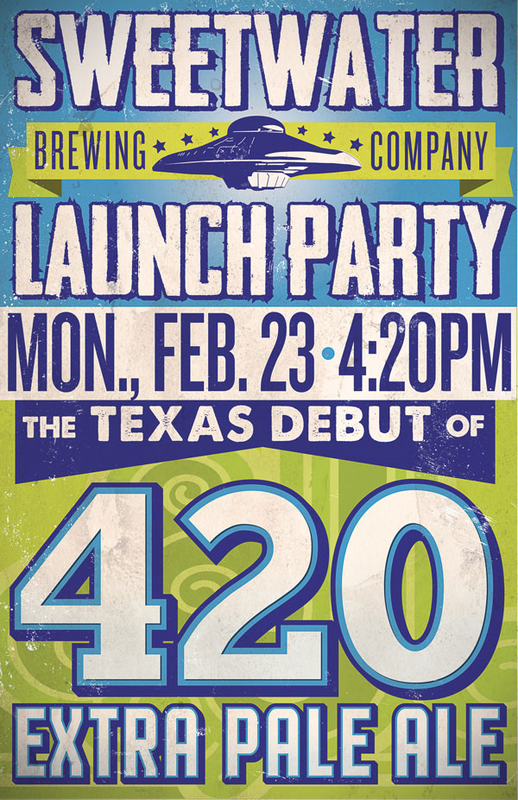 Another week, another out of state brewery makes its debut in Texas. This time it's Alpine Beer Company from Alpine, California (sort of). 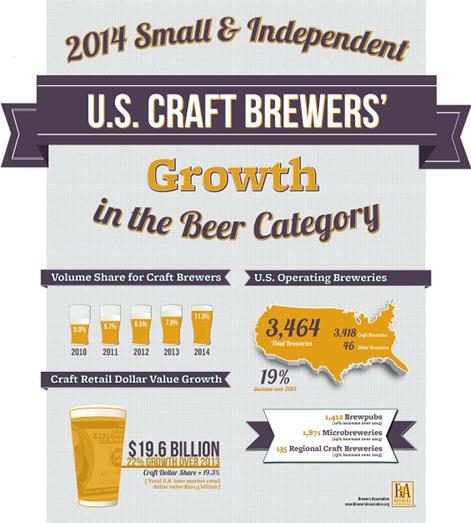 I'm happy to see that Alpine was able to find help from within the craft brewing industry. I'm sure we'll be seeing more mergers and takeovers in the future as the older craft breweries continue to expand and seek new markets and revenue streams. And this is definitely preferred over a takeover by ABImBev. Sweetwater Brewing, named for a tributary of the Chattahoochee River, was founded in Atlanta, GA in 1997 by two former college roommates. It has since grown to be the 19th largest craft brewery thanks to their most popular beer, 420 Extra Pale Ale, and the rest of their regular lineup which includes the Sweetwater IPA, Georgia Brown Ale and Take Two Pils along with Blue (a light bodied ale with a hint of blueberry) and Hop Hash Double IPA (made with the hop resin scraped out of the hop pelletizer). In addition to those, I also found events at Hay Merchant today and Ladybirds on Thursday. 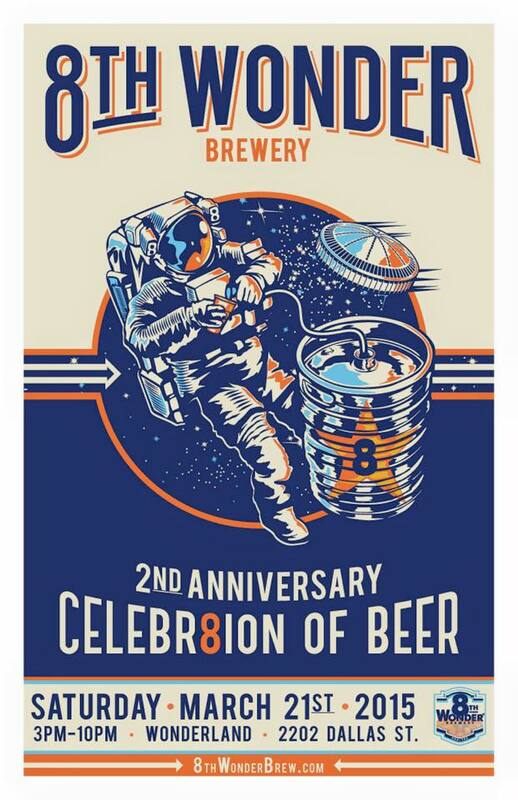 8th Wonder is celebrating two years of brewing beer in the shadow of the Houston skyline with a party on Saturday, March 21st at 3:00pm. Tickets are available online and priced at $100 for VIP or $25 for General Admission. Only 200 of the VIP tickets are available and prices will increase after March 1st. Further details about what the VIP level gets you hasn't been released yet, but a post on their Facebook page indicated "rare tappings, private bathroom, merch, light bites, pint glasses and more". The event also includes musical performances by: The Suffers, Earphunk, Stooges Brass Band, Wild Moccasins, DJ Sun and Fox & Cats. Post by The Hay Merchant.